Check out our newest products! I am glad to see you here, reading these lines—about something that was born in 2003 and has just come of age in 2018. I first encountered the flowerstick 15 years ago as a university student, and it captivated me immediately. I was, on the one hand, enraptured by the game itself, and on the other hand, by the love and enthusiasm that surrounded it everywhere, putting smiles on people’s faces. We produced the first of our own sticks in 2004, followed by tens of thousands more, of ever-improving quality, sold on 5 continents. By 2018, it has become a brand with lifelong guarantee on its products, while it is also on the cutting edge of innovation. 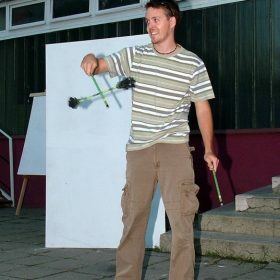 We manufacture the best juggling stick, which is also the easiest to play with, and with our support, anyone can acquire the skills needed for the game in no time. This includes our state-of-the-art website, where you can find all the important information about the game, as well as our own educational video series, which helps you to learn the game step-by-step, and last but not least, an enthusiastic and youthful team that have brought the basics of this game to hundreds of thousands of people in recent years. Creating value is a rewarding feeling, and fortunate are those who can call their hobby their profession. Thank you for allowing me that privilege. This entry was posted in Uncategorized and tagged devilstick, flowerstick, juggling, juggling stick. Drop us a message below! XtremestiX is a 15 years old team, which only goal is to make the best skill developing juggling stick from 6 - 99 years age use. We provide forever life guarantee for most of our products to prove this. Sign up to our newsletter to be informed about the latest news. I understand and agree with the site's Data Protection Manual .